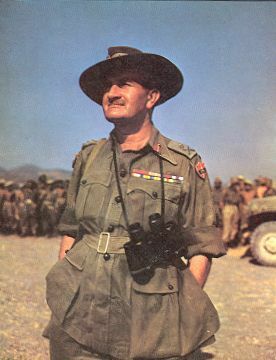 Citation: C N Trueman "The Race to Rangoon 1945"
After the Allies success at Kohima and Imphalin 1944, General ‘Bill’ Slim’s desire was to get to Rangoon as soon as was feasible. Rangoon was the major port that Slim believed the Allies needed if they were to defeat the supply problems that had dogged the Burma campaign. Such was the nature of Burma that much of what the Allies needed had to be flown in and aerial supplies were notoriously difficult to predict. Supplies could be dropped and lost in the jungle or aircraft simply could not fly as a result of fast-changing weather issues. Therefore, an established port such as Rangoon would have been of an immense help to Slim and his men. this would seriously hinder Slim. Mid-May was the time when the monsoon was expected and this would have severely hampered transport as roads, as they were, could be washed away and the general living conditions for the men of the 14th would have been miserable. However, Slim was also aware of the problems that the monsoon would bring him and he resolved to get to Rangoon before mid-May. In early April, Slim ordered the 14th Army to move south. The 268th Indian Infantry Brigade, commanded by Brigadier G M Dyer, and the 5th Brigade from the 2nd Division advanced through the Irrawaddy Valley. Their task was to divide in two the Japanese forces that were expected to defend Rangoon with vigour. Slim’s main force advanced along a separate route – the Toungoo/Pegu railway route, which followed a route almost exactly south from Meiktila. Both forces were expected to encounter strong Japanese opposition but Kimura was faced with the choice of splitting his army and therefore weakening it or concentrating all his men on one of Slim’s forces and leaving the other to advance before confronting it. Kimura decided on the former. As the Allies moved south along the Irrawaddy Valley, they found that the Japanese had withdrawn from many of their positions. Left behind were guards who were expected to fight to the last. These guards acted as a delay but could not hold up for long units equipped with Lee-Grant tanks. However, Slim’s main force, the 4th Corps, moving directly south from Meiktila, met with stiff resistance around the town of Pyawbwe, some 30 miles from Meiktila. In the fighting for Pyawbwe over 1,100 Japanese soldiers were killed and 9 Japanese tanks were destroyed. The fighting at Pyawbwe was to prove crucial. The Japanese force in Burma simply could not sustain such losses. On paper the Japanese XXXIII Army had three divisions of men but in April 1945, it barely constituted a single division. Those men in the XXXIII who could still fight were very short of ammunition and food. The loss of 9 tanks was also of great importance as 4th Corps had great strength in armour. A column of 1,200 tanks, jeeps, lorries, armoured cars and bridging vehicles moved south. 1,900 tons of Bailey bridging equipment was carried. Four Japanese fighter aeroplanes attacked this force on April 11thand 12 lorries were lost. However, the Japanese could only delay the advance of the Allies as it had all but gathered a momentum of its own. At Pyimana, about 100 miles south of Meiktila, tanks from 9th Brigade narrowly missed capturing General Honda, commander of the XXXIII Army. By April 22nd, the Allies had reached Yedashe, only 184 miles from Rangoon. Their task was made easier by the work of the Karen Levies – groups of ex-Burmese Army men – who were organised by Force 136, Asia’s equivalent of the Special Operations Executive. The Karen Levies blew up the bridges and roads that the Japanese tried to use when moving their men and equipment. The work they did was of great importance as it meant that the Japanese were fighting two forces – one advancing at great speed towards Rangoon and the other unseen. On April 23rd, 4th Corps reached the town of Toungoo, three days ahead of schedule. However, the monsoon had started earlier than expected and any attempt to fly fighters out of the two airfields at Toungoo came to nothing. On May 1st, men from the 2/3rd Ghurkha Parachute Battalion had been dropped at Elephant Point, an area that commanded the entrance to Rangoon Harbour. After a fierce fight, they took Elephant Point and killed all but one of the Japanese defenders stationed there. At 07.00 on May 2nd, the first landings took place. In fact, by the time the Allies reached Rangoon itself, they found no Japanese there. At 16.00 on May 3rd, troops from the 8/13th Frontier Force Rifles and 1/8th Ghurkha Rifles landed at the docks in Rangoon. It took two weeks to repair the harbour buildings and to sweep the water for mines but by mid-May, much needed supplies of all sorts were being unloaded at the docks.